It’s one thing for investors to sense something is changing at big banks. It’s another to see it in sharp relief. As banks recently rolled out annual securities filings, Bank of America ’s provided concrete examples of how the biggest financial firms are changing: making fewer loans while growing holdings of safe assets; simplifying Byzantine structures; and exiting lines of business. That has come about as banks have faced an onslaught of new regulatory constraints. Foremost among these has been the Federal Reserve’s annual stress tests and capital-planning review, the results of which will be released Thursday and next week, respectively. Of course, plenty of banks and investors have concluded the rules, tests, and changes have placed a huge burden on banks, tamping down profits and returns. In one sense they have. Seven of the 10 largest banks reported lower yearly profits in 2014, according to Federal Deposit Insurance Corp. data. Looked at another way, though, in terms of the risk posed by banks, there may be a benefit that has yet to fully materialize: As investors recognize big banks have grown safer, their theoretical cost of capital should shrink and earnings multiples could expand. 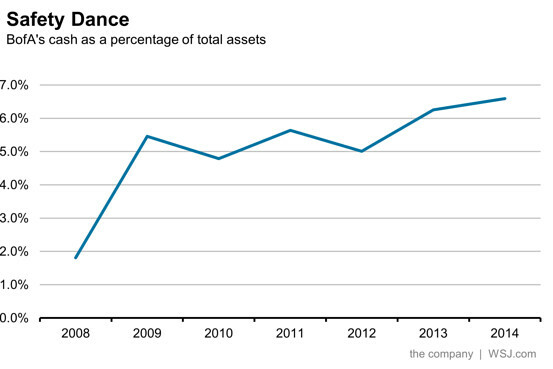 BofA’s latest annual filing shows how the bank’s risk profile is changing. It has, for example, slashed the number of subsidiaries to 103 from over 1,300. Loans and leases were 5% lower at the end of 2014 than a year before, while its bond portfolio grew by 17%. Overall, BofA’s balance sheet remained about the same size. To put that into perspective, BofA’s loan book is now smaller than it has been since 2007, before the acquisition of Countrywide and Merrill Lynch. Its bondholdings have grown 78% since then. This bond accumulation is happening across the banking system. Fourth-quarter FDIC data show bondholdings at all insured banks up 68% since the end of 2007, with large banks growing their portfolios faster than smaller banks. While lower loan demand and superlow interest rates play a part, the divergence between the largest banks and their smaller brethren, particularly in the past year, suggests a strong role for regulation.Loan contraction is exclusive to the largest banks under the tightest regulatory scrutiny. Loans and leases at small U.S. banks actually grew by 7.6% last year. Aggregate loans and leases at all U.S. commercial banks are up 18.4% since 2007. Big banks are also holding far more cash than they did previously. The new liquidity-coverage rule, which requires banks to hold assets that can easily be sold in a stress scenario, is a key driver. In practice, this largely translates into a mandate to hold Treasurys, debt of government agencies and cash. Higher capital requirements also contribute. As loan portfolios require more capital support, cash and Treasurys are attractive because of their zero-risk weighting. As a result of the change in its asset mix, BofA’s risk-weighted assets fell nearly 3% in 2014 even as its actual asset level remained flat. The cost of this march to safety is lower returns. 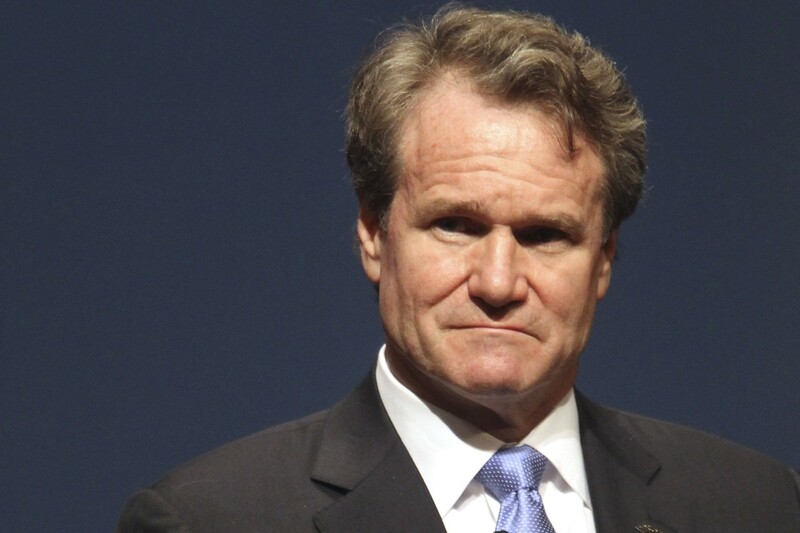 BofA’s net interest income, excluding income from trading assets, fell $2.1 billion from the prior year. Interest income from bondholdings was lower than the prior year despite the increase in the size of the bond portfolio. This is painful for investors, but it doesn’t have to be calamitous. For starters, the shift is likely to become less pronounced as loan demand strengthens and as interest rates rise. Cost-of-capital assumptions should also change. For years, analysts have assumed a 10% theoretical cost of bank capital. Banks whose returns fell short were often described as value-destroying. But a better-capitalized bank with a safer portfolio of assets should have a lower cost of capital. So while BofAs long-term earnings power may be diminished, it is taking on less risk for each dollar earned. In the end, shares of BofA and other big banks could get a boost if investors recognize this.